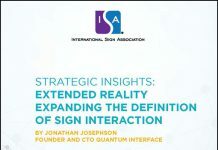 As the leading tradeshow in the sign, graphics, and visual communications industry, ISA International Sign Expo® 2019 is known for its eye-popping displays and creative touches. Much of that comes as exhibitors donate products to enhance the experience of attendees and gives them a real-world application for products showcased at the Sign Expo tradeshow and educational events. These in-kind products allow exhibitors to showcase their products in new and interesting ways. Attendees at ISA Sign Expo 2019 will be able to see the following products in use and engage with the companies on the tradeshow floor. In all, more than 600 exhibitors will be showcasing the latest products in the sign, graphics, and visual communications industry. 3M, Booth 4235. Several floor directionals, at the start of the Bayside Foyer and inside the Sign Expo tradeshow, feature 3M™ Controltac™ Print Film 40C. In the Lounge & Learn (booth 5021), the 3M™ Controltac™ Print Film 40C 3M™ Scotchcal™ Luster Overlaminate 8509 is used. Column clings at the entrance to Bayside Foyer are 3M™ Envision™ Print Wrap Film SV480mC and 3M™ Envision™ Matte Wrap Overlaminate 8550M. Door clings on the exterior entrance doors of the Bayside E/F Foyer are 3M™ Window Film 8170-P40 and 3M™ Scotchcal™ Gloss Overlaminate 8518. Banner Ups / E. L. Hatton Sales Co., Booth 2103, utilizing Fisher Textiles, Booth 4017. Banner Ups / E. L. Hatton Sales Co. displays its SEGDesign Modular SEG Frame product in the ISA Innovation Awards Display located in the Bayside Foyer outside the exhibit hall. The display was constructed using SEGDesign 15mm ABS frame stock and modular corners which were custom painted in four colors: red, orange, pink, and matte black. The fabric printed faces were printed by dye sublimation on Fisher Textiles GF 4080 Heavy Duty Knit. GF 4080 is 100 percent polyester, wrinkle resistant, moderately opaque and flame retardant. Daktronics, Booth 2725. Daktronics’s Digital Street Furniture Display, located in the Bayside Foyer outside the exhibit hall, displays the daily schedule and includes the most up-to-date information. Photo Tex Group, Booth 2647. Photo Tex Group’s Photo Tex can be found as a directional on the wall near the Starbucks end of the North Convention center, and also as a mirror cling at the opposite end of the North Convention Center (lower level). The company also has a column cling and wall cling in the pool walkway. Radiant Manufacturing, Booth 847. Radiant’s SolaRay panels are used as the hanging signs in attendee registration. Vantage LED, Booth 3463. Vantage LED provided the charging stations throughout the Sign Expo tradeshow floor and pre-function space to recharge devices and get up-to-date information on the company’s digital displays. WS Display, Booth 4165. WS Display’s EZ Extend 3ft and EZ Extend Circles 5ft remind attendees to “Go Big, Go Bold, Go Further” and also as “See You Next Year” signage. EZ Extend Circles 7ft are used for Sign Code Help and promotion to become an ISA member. These are all located in the Bayside Foyer outside the exhibit hall. The company’s barrier displays are used in the National Installations Wrap Cup 2019, powered by 3M (booth 561) and the EZ Tube 10ft Straight Display can be seen as the Game Changers backdrop in education. There’s still time to register and experience the “WOW, I didn’t even know that product existed” that ISA Sign Expo offers sign, graphics, print, and visual communications companies. Register using code INKIND19 for a free tradeshow pass, or bring this code and register onsite.